" The email newsletter I receive from you is showing in my gmail as "unencrypted," with a red pad lock. There is also a new warning banner that says: 'Be careful with this message. It contains content that's typically used to steal personal information.' The options are: learn more, report this suspicious message, ignore, or 'I trust this message.' This is not the only email I get that shows as unencrypted. What does this mean and how can it be fixed? " 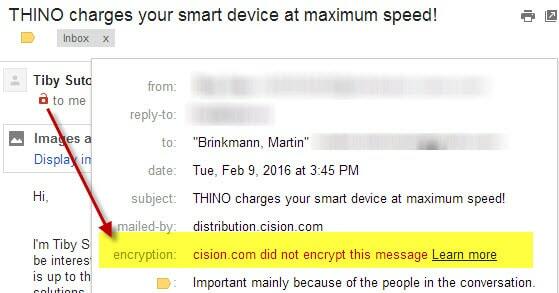 Essentially it means that the mail you received (at gmail) was not sent using email encryption. I'll explain more about that below; "fixing it" can only be done by mail server (or server administrator) responsible for delivering the email to you. In other words, it's not really something you have control over unless you are a server administrator. Note: if you are operating a domain / mail server and are primarily interested in 'how to configure postfix for outgoing email encryption to gmail servers' portion, you can skip ahead, or continue reading below. What Does it Mean if Gmail Reports my Email isn't Encrypted (Red Pad Lock)? When you send an email, it is queued for delivery at the mail server. In this case, the Infopackets mail server was responsible for sending you the Infopackets newsletter to your gmail address. When the Infopackets mail server connects with gmail's mail server, it initiates what is called a 'handshaking protocol' to begin the email delivery. You received the gmail 'red pad lock' on your message because the handshaking protocol was not encrypted using valid security certificates (and using a TLS handshaking protocol). As such, this theoretically could mean that the message could have been intercepted and therefore modified during its transmission. Similar technology is used with Wifi signals - if you don't encrypt the Wifi signal, data is open and therefore susceptible to being "sniffed" and potentially modified while in transit. To fix this error, the server sending the email must deliver the message using a valid SSL security certificate with TLS handshaking enabled - once again, this would be a server administration task and not something you need to concern yourself with. It's important to note that if you receive an email at gmail with a red pad lock, it doesn't necessarily mean that the message has been compromised - it simply means that the message wasn't sent using encryption. With that said, email encryption is not really a standard - but it will soon become a standard. I was also notified in yesterday's article (in the comments section) that other users were complaining of the same thing. I did not notice this before because I don't use gmail to read my gmails - I use an email client. After about 6 hours or so last night I was able to fix the error. Below I'll explain the steps I took to fix it. When I first researched the "red padlock" issue using gmail, the gmail website itself told me I needed S/MIME (Secure/Multipurpose Internet Mail Extensions) in order to encrypt the emails. Searching google how to configure a mailserver for S/MIME did not come up with much; instead I found out that I could simply modify postfix (my mail transport agent, or MTA) to use TLS encryption on outgoing messages from the mail server. The question is - how do you get the cacert.pem (certificate authority certificate) file to make this happen? The answer is that you need to either (a) buy an SSL certificate and generate your own cacert.pem (I am not yet sure how to do that), (b) use 'letsencrypt' which produces a free, valid SSL certificates, and generate your own cacert.pem, or (c) generate your own TLS keys and cacert.pem using openSSL. I tried 'letsencrypt' but the program aborted with errors - apparently the latest revision has bugs which are still being worked on. As such, I chose option (c) since that was the only viable choice at the time. Important: If you already had TLS enabled encryption on incoming email (from your PC to your mail server) you will have to regenerate your TLS certificates. It is necessary so that you can generate the cacert.pem file (which is used to encrypt the emails to the gmail server). Here are the steps I went through, based on the tutorial found over at e-rave.nl. My comments are marked with four hash marks (####). ####Next, generate a private key for the server. Use a random password generator to generate a strong password, and put it aside in a notepad file so you can copy and paste the password into the terminal window when prompted. The below command will ask for the randomly generated password. ####Now it's time to create the certificate request. The below command will ask for the randomly generated password; it will also ask you for the "common" name used when creating the certificate - enter your web server domain name in this field. Near the end it will also ask for 'extra attributes' password - do not enter a password here. ####Now it's time to create the self-signed key. It will also ask for the randomly generated password. ####Now we need to remove the password from the private certificate so that there is no need to enter in a password when you restart postfix. You will need to enter in the randomly generated password. ####The command below will overwrite the old key with the new key (without password). ####Now it's time to make yourself the "trusted certificate authority". This is the file used on outgoing TLS handshakes (to gmail, etc) to encrypt the emails. The below command will create a cacert.pem file that is good for 10 years. You will need to enter in the randomly generated password. When it asks for your the 'common' name, enter in your web domain name. ####Make directories for the certificates and give proper chmod permissions. ####myhostname - DOMAIN NAME MUST MATCH YOUR CERTIFICATE'S "COMMON" NAME! At this point I suggest you send an email to your mail server while monitoring the mail log for errors ('tail -f /var/log/maillog'). If you already had TLS enabled in the email client for your SMTP server (to encrypt emails sent from your PC, for example), you may need to re-accept the certificates in your email client on the PC. If it works without any issues, it's time to enable TLS handshaking for outgoing emails from your mail server to another server. This should finally encrypt your outgoing mails and get rid of the red pad lock commonly seen in the gmail interface for emails that aren't encrypted. Since the mail certificates were self signed, the pad lock won't turn green, but will simply not show. ####The below commands will copy your cacert.pem file to /usr/share/pki/ca-trust-source/anchors/, where you it can be adopted it as server-wide authority trust. This will prevent "verify return code: 19 (self signed certificate in certificate chain)" error messages. I am not 100% sure if this is necessary but I came across this while researching the issue and thought it wouldn't hurt. ####Assign postfix permissions to the cacert.pem file. Cacert.pem = certificate authority (public, not private). ####Finally, modify postfix so that outgoing emails are TLS enabled so that emails are encrypted. I hope this saves someone hours of frustration trying to do the same (and clarifies some things I just couldn't find the answer to)!